Here at East-West Brother's Garage, our test drives are usually on newer cars. Every now and then though, we come across something that is simply too good to pass up a test drive of. While driving to work one morning, a blue sedan with a big wing caught my attention at the local Honda dealer. Upon closer inspection, it was a Mitsubishi Lancer Evolution. 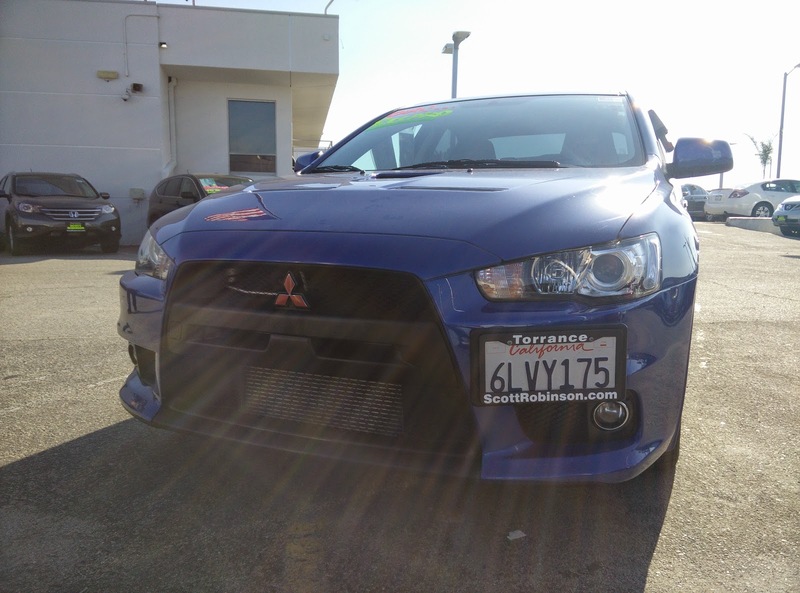 Having never driven an Evo before, I made it a point to stop in and check out the rally bred sedan for myself. 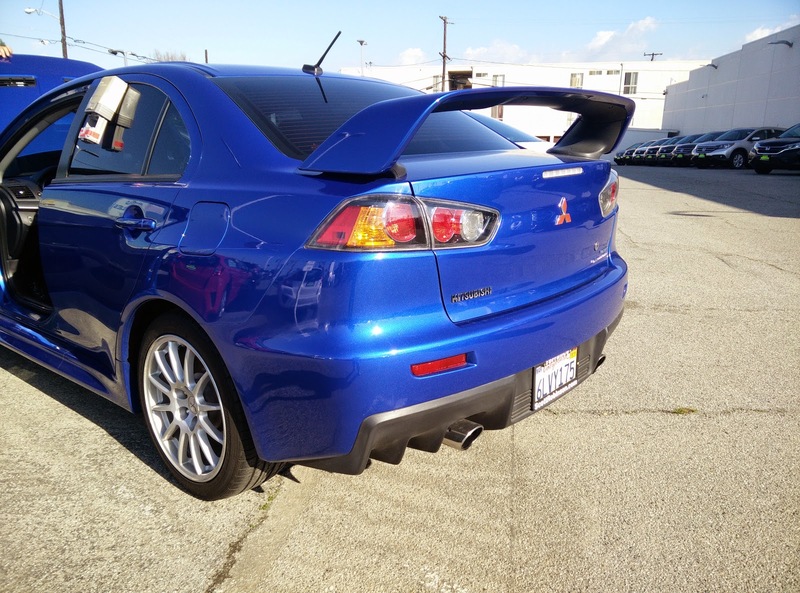 Tucked away in a corner of the local Honda dealer's used car lot, the Octane Blue Pearl Lancer Evolution GSR caught my attention, not just because of the big wing, but also because the shade of blue was very similar to my own S2000. 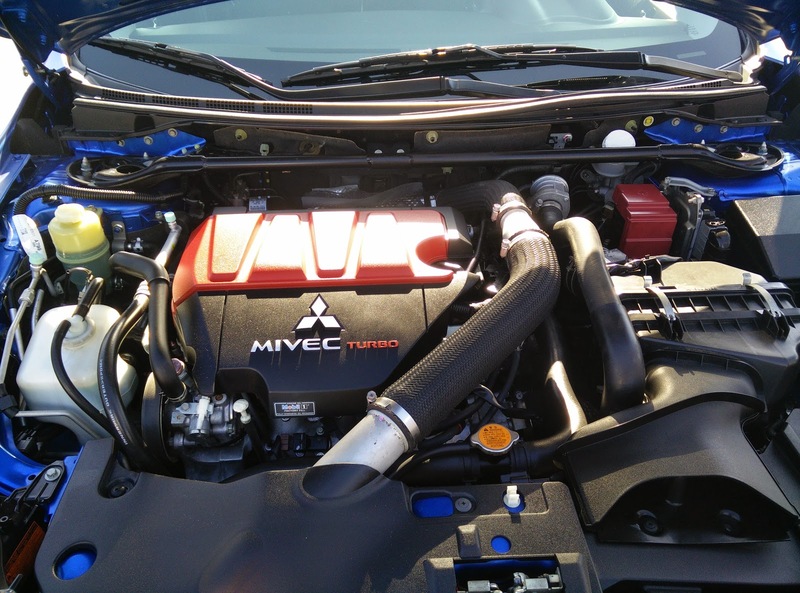 As I got out to inspect the Evo, the first thought that popped into my mind was, "I really like how Mitsubishi can take such a ho-hum looking car like the Lancer and turn it into something aggressive and sinister looking like the Evo." As I continued to circle the car, a salesman came over to introduce himself and offer a test drive of the Evo. 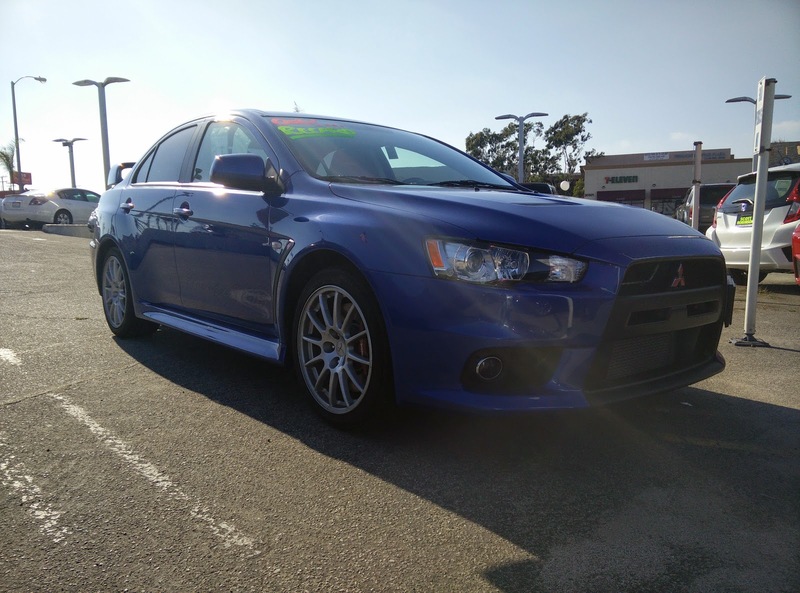 After spending a few minutes shuffling cars around to get the Evo out, I was able to back it out of the tiny corner it was stuck in and out into an open area of the dealer's lot. I took some time to take a look at the interior and get a feel for everything. Besides the shift knob, which was aftermarket, there was one thought that came into my mind: "holy crap, everything in this car looks and feels so cheap!" 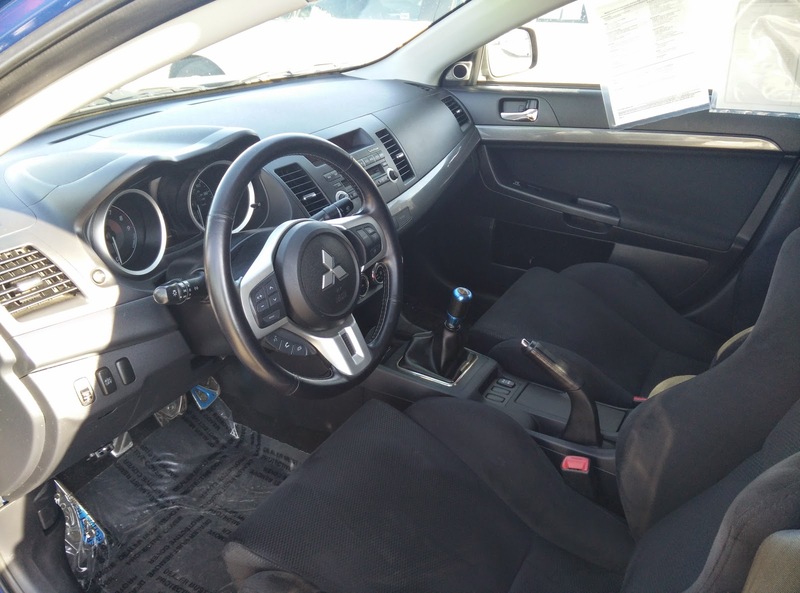 Just like its rival, the Subaru WRX, the Mitsubishi Lancer Evolution is built off of a car that is designed to meet a price point, and just like the WRX, a lot of the cheap interior materials gets carried over into a car that can easily cost well over $30,000. And just like its rival, it became blatantly clear where all that money went once I started driving. Thankfully, the materials used for the seats were actually quite good. I certainly hoped they would be as the Evo comes equipped standard with Recaro bucket seats. How embarrassing would it be for both Mitsubishi and Recaro if the materials used for these seats were the same as the cheap fabric used in the basic Lancer? These are definitely some of the most aggressively bolstered seats I have ever sat it. It took a few minutes to get used to, but eventually was able to get comfortable. After doing a bit of driving, I could see why Mitsubishi chose to use such a heavy bolstering. I am curious as to how these seats would fair on a long road trip though. Putting the car into first gear, I noticed how heavy the clutch was, and how short the shift throws were. I have always thought that the clutch in my S2000 was already pretty heavy, but the Evo definitely takes it up a notch. Shift throws were pleasantly short and the engagement through each gear felt incredibly solid. In short, the transmission felt exactly like the one in my S2000 albeit with an slightly heavier, aftermarket clutch and was short one forward gear. I could do without the aftermarket shift knob that came in this car though. While cool looking because it matches the exterior color of the car, it seemed tacky even for this car. With the transmission sorted out, I set off out of the Honda dealer. Despite the heavy clutch, the Evo is surprisingly easy to drive. The 2.0 liter turbocharged inline-four offers good power in the low RPM range which makes normal driving a relatively simple task. Once you hit around 3,000 RPM though, that is when things get fun. Boost from the turbo comes in strong and rockets the car forward, pushing you back in the seats. The noise coming from the intake and exhaust is intoxicating. I personally feel it does not quite match the sound you get from a naturally aspirated engine, but push the car hard enough and you get to hear those satisfying "whooshing" turbo noises. Once you are in the real meat of the car's power band, the 7,000rpm redline approaches fast. Overall, I was just surprised at how smooth the engine operated and how little turbo lag I felt during my test drive. As to be expected, handling in this car was spectacular. I do not think I have ever driven a sedan that cornered as flat or as quickly as the Evo did. Being an all-wheel drive car, there was a little bit of pushing and understeering but it was extremely minor and easy to fix. What surprised me the most was how manageable the ride was. I had thought that because this was an Evo, the ride was going to be extremely harsh and painful. It ended up being about as harsh as the 2008 Acura TL Type-S that I used to drive, which struck a very good balance of stiffness and the ability to soak up poor road conditions. I also really enjoyed the steering in this car. Even though the steering wheel could only tilt (which is already better than my S2000, which does not adjust at all), the communication from the front wheels was excellent. 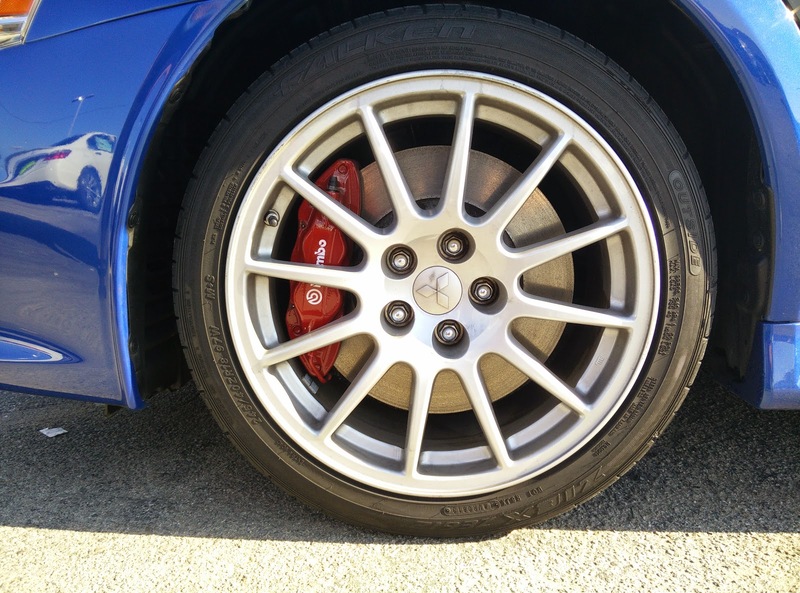 Those Brembo brakes also do wonders to get this car to a stop without any drama. So were there any other downsides to the Evo other than its cheap interior? The trunk was laughably small. I feel like it was even smaller than the trunk in the Accord Plug-In I tested a while back. There is a reason for this though. In an effort to balance the weight of the car, and to make room for all the turbo components up front, Mitsubishi moved the battery and wiper fluid to the back of the car. There is also a Rockford Fosgate sub-woofer eating up a chunk of real estate in the trunk as well. Sure, it may be a sedan, but if you can barely fit one medium sized suitcase in the trunk, what is the point? Oh, and that giant wing gets really annoying when you are trying to back out or check your blind spots when changing lanes. I admit, I was extremely tempted to trade my S2000 in right then and there and just drive that Evo home. 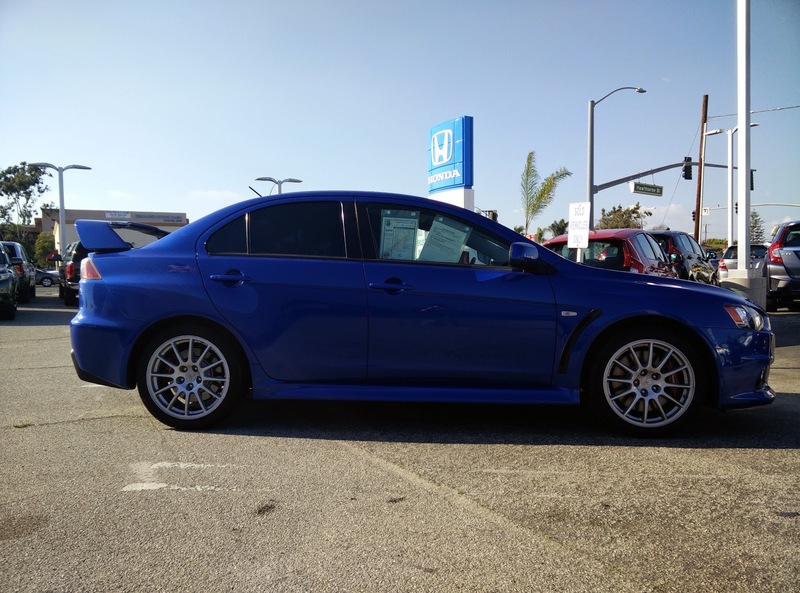 Of course, reality set in and I realized that the Evo rides about as harsh as my S2000, gets only slightly better fuel economy, has a trunk that is about the same size as in my own car, and has rear seats that I would never allow my friends to sit in for any extended period of time. Sure, it may be faster, but in the end I would just be trading an impractical car for an only slightly more practical car. Besides, I like driving a convertible...and not having to worry about a car payment helps too.